I had a great time in Aspen this weekend. 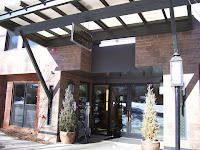 I got to stay at The Limelight Lodge which is a great location in Aspen. You can walk to everything very easily. They have a complimentary continental breakfast with the stay that is much more than a typical continental breakfast. The Limelight has live music 5 nights a week in the lobby area and you can order drinks and food. The rooms are very nice and the beds are very comfortable. They have ski lockers and a private skier shuttle to take you to all 4 mountains. They have a nice pool and two big hot tubs. I really liked that they had a laundry room that guest can use during their stay. The Limelight Lodge Inside Tracks is a complimentary ski/ride guide service offered in partnership with Ski & Snowboard Schools of Aspen/Snowmass for Limelight Lodge guests. Offered 2 days per week, this service will provide a unique opportunity for Limelight Lodge guests to experience the sensational terrain and services of the four mountains of Aspen/Snowmass combined with the expertise of the Schools top professionals. 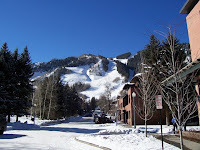 Aspen is a great destination with first class dining, shopping and skiing. Thank you Aspen and The Limelight Lodge.